Wash the chicken, pat dry with paper towels. Place the chicken breast side up in a middle of a roasting pan, just large enough to hold the chicken. Grate lemon on a fine grater, to get the lemon peel (don't grate the white part of the skins, only the yellow part). Cut the lemon into 4 parts, length-wise. Smash and mince the garlic. Mix together lemon peel, garlic, thyme leaves, salt, pepper, and olive oil. Put aside 1 table spoon of lemon-thyme mixture. Rub the chicken with the remaining lemon-thyme mixture on all sides. Place the quartered into the chicken cavity. Optional: Tie the legs with a string. Place the chicken into the pre-heated oven. Cook for 20 minutes. Reduce the heat to 375ºF, roast another 1 hour, or until meat thermometer inserted into the chicken thigh reads 180ºF. When the chicken is ready, take it out of the pan, letting all the juices drib back into the pan, and place it on a serving plate. Let stand for 10 minutes. Meanwhile, place the roasting pan onto the large burner on the stove, and turn the heat to maximum. Add 1/2 cup chicken broth and 1/2 cup white wine. Let boil vigourously, stirring often and scraping the bottom of the pan — discard all solid and burned bits. Add the remaining table spoon of lemon-thyme mixture, and continue boiling until desired thickness is achieved. To speed up the process, sprinkle with a large pinch of flour and mix well. Pour the gravy into the serving boat. 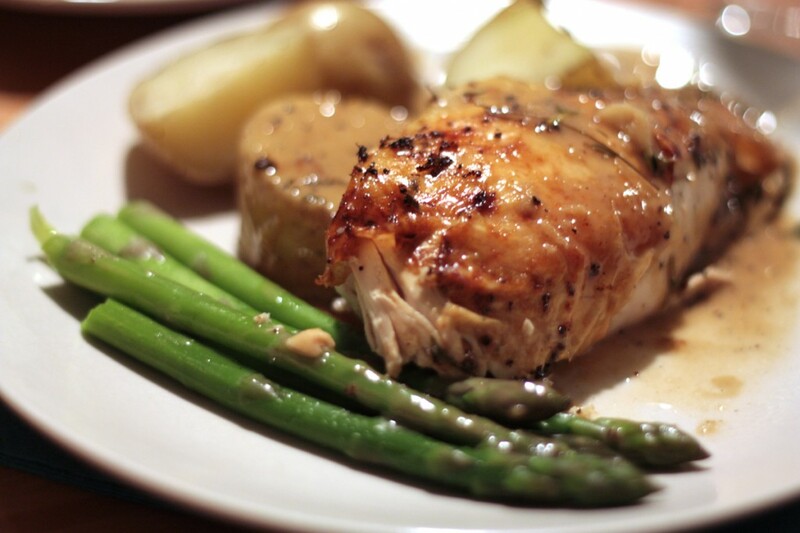 Serve chicken with boiled potatoes or rice, with a side of steamed vegetables. Enjoy!